An Oxfordshire farmer woke up one morning to find this epic jellyfish crop circle in his field (or so he claims). The farmer, R. Spence, has submitted that no one has access to his land, leading us to speculate that a race of alien Jellyfish are trying to make a bold political statement. 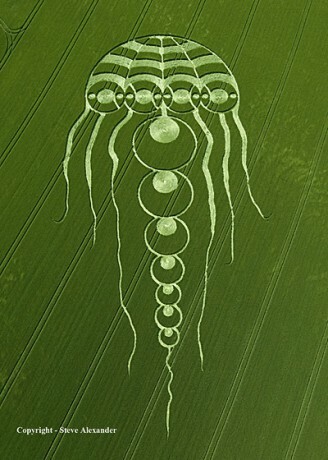 Notice how the aliens have been getting far more ornate with their crop circles since the first ones started popping up in the sixties, we wonder why that is? I'd suggest PZ Myers had been up to no good, except he'd have drawn a better jellyfish. That one is not anatomically correct. “Wowie wow wow!”, as Christopher Walken's sometimes guest character, The Continental, would blurt out as his trademark exclamation during his phenomenally hilarious skit on Saturday Night Live … I bet the High Priest of the (actual!) Cult of Cthulhu, Venger As'Nas Satanis would like to get all the credit for this cereaglyph! Yikes! Thanks for posting it! If this was a fake (made by humans on the ground) where are all the signs of trampling around and to and from the image? There are none. I know of these jelly-fish as we found a swarm of them at a local lake a couple of years ago. My grandsons and I took one to the zoo aquarium to see what it was but they didn't know either…just it was still alive for awhile. They had no tentacles though. Needless to say we don't go in the water there anymore.